The Merino stud was founded in 1990 with a split of the Eastville stud (founded 1943). At this time the stud was predominantly a Collinsville daughter stud and was classed by Ken Doncon.It was known for its large frames and quick maturity. Throughout the early 1990s numerous Barloo sires were used including the famous Dominator family which helped maintain the large frame. During the late 1990s sires from the Collinsville Goliath and Premier families were used. These sires helped reduce micron and improve comfort factor dramatically. Numerous sires were kept from the Goliath family including Eastville Park Wal which was sashed the supreme exhibit at the 2001 Adelaide Show. In 202 JC&S (Monarch) 16 was used and it produced the Coronation family. In 2007 East Mundalla 3 was purchased for $11,500 and the Western Star family was started. It has helped improve staple length and reduce body wrinkle without losing wool cut. This family has also bred numerous sires including the 2009 and 2010 Perth Royal Show junior champion rams. In 2010 Nathan King took over the classing of the stud following Ken Doncon’s retirement. In 2011 Greenfields 21 was purchased from the Royal Adelaide Show for $13,500. This ram is from the Charinga Big Tom family and his progeny show extreme body size while carrying a bold crimping low micron wool. Progeny of G21 was sashed grand champion autumn shorn ewe and champion autumn shorn strong wool Merino ram at Katanning in 2013 as well as champion autumn shorn ram at the 2013 Perth Royal Show. In 2012 East Mundalla Jonty was used and his progeny will be available in 2014. All of these families have helped produce the large frame, heavy cutting medium micron wools which Eastville Park is well known for. The Poll stud was founded under the guidance of Ken Doncon in 2000 with the purchase of three rams from Collinsville Poll Merino stud and the transfer of 80 ewes from the Eastville Park Merino stud. All three rams were from the Glenroy 847 family. These rams were plainer in type and the result had an immediate impact in sales. In 2007 Manunda 1454 (Perth Royal Show junior champion) was purchased for $15,000. His progeny show great size and conformation while carrying a white medium wool. They also have a good poll factor with all sons carrying the PP gene. Manunda 1454 sired the 2011 Perth Royal Show junior champion ram (EP89). In 2010 Nathan King took over the classing of the stud with the retirement of Ken Doncon and Coromandel 2 was used within the stud in that year. This ram had an immediate impact producing progeny with a rich medium wool combined with Eastville Park’s large frame and sound conformation. In 2013 the stud had a remarkable Rabobank Katanning Show, exhibiting the champion find-medium, medium and strong wool March shorn Poll Merino rams and champion March shorn Poll Merino ewe. 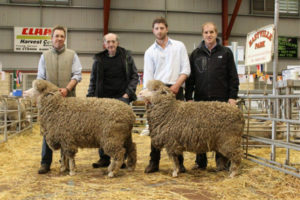 It also exhibited the junior champion ram of show and the winning Elders Field Day Four Regulation shorn team. Also at Katanning it sold two Poll Merino rams for $5,000 each to the East Mundalla and Leovale studs. The stud’s aim is to produce a Poll Merino ram that is large in frame but still carries a quality wool to go with it. The combinations of these families are helping in ensuring this. Quailerup Merino Stud was founded in 1941 by TS Scanlon with his son TB Scanlon with ewes from Boconnoc Park and Mannanarie flocks. Quailerup Stud was split in 2002 and Quailerup West was founded by Tom Scanlon & Co.
Roseville Park has been the main bloodline for the stud for the past 30 years, along with its own bloodline. The stud has had a major influence on many breeding programs through its well known sire Quailerup West Western Purple 24. The Western Purple bloodline still appears in many stud pedigrees across Western Australia and Australia. The Poll Stud was founded in Februrary 2011 with rams from Keetlen Valley and ewes from Shahs and also the transfer of rams, ewes, ram lambs & ewe lambs from Mandalay. In October 2015 James and Camille Scanlon decided to sell the stud (after the passing of Tom in July). The Mullan family bought the Quailerup West Merino & Poll Merino Stud in November 2015.